A pyramid of ideas informs the Défilé collection in a stream of consciousness from the Artisanal universe, as Maison Margiela explores a curious alignment of elegance and modernity. Spring Summer 2017 settles upon the merging vocabularies of archetypal, sports, and historical references: extracting the spectacular from the mundane for a triumphant reinvention of heritage. 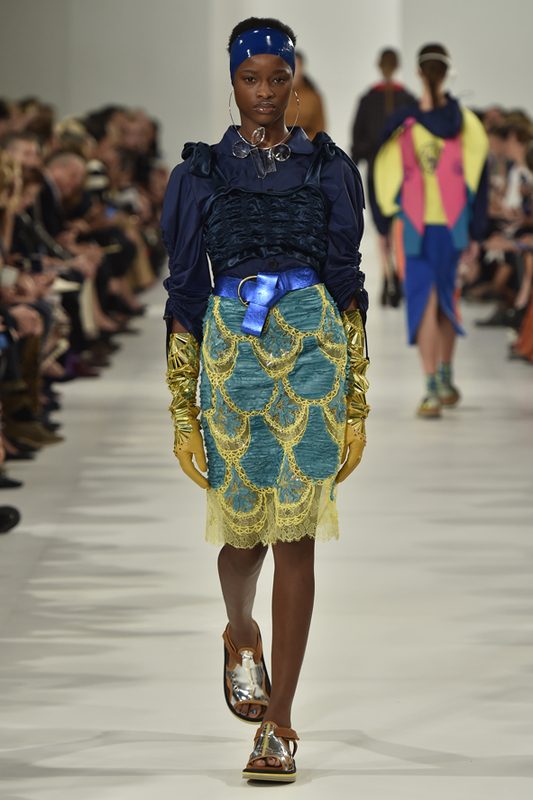 A pivotal collection emerges through the house vocabulary defined by Creative Director John Galliano, with a dynamic sense of unconscious glamour. A cross-pollination of codes draws the eye to focus in desire and delight. It is only through an encyclopaedic knowledge of textiles that their innate properties may be subverted into new forms. Applied as such, sports mesh is ruched into flouncing blouse shoulders, or ripstop nylon embroidered as ribbons on fluorescent lace. Industrial vulcanized cotton finds new softness as a trench coat in palest celadon green, whilst bouclé mohair and wetsuit neoprene are fused with crochet. Tattersall checked cotton, striped poplin, classic gabardine and wool gauze are interrupted by the omnipresent metaphor of the lining in tessellated bird print nylon. Everyday garments take on new lives when their archetypal structures are questioned and transformed by new compositions and finishes. 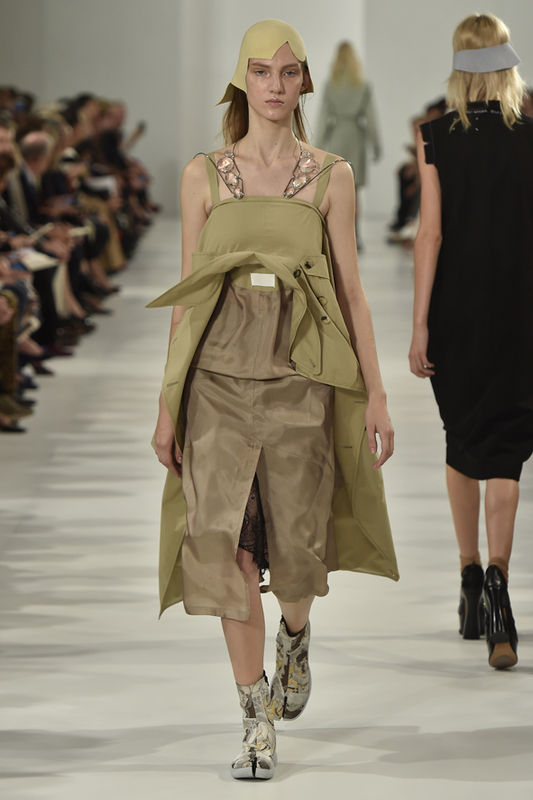 Here the ‘anonymity’ of the lining emerges anew: the collar of a suspended trench dress falls as a new empire line, cabans are dissected down the lapel to expose wading, and a sports mesh smock sweeps into a Watteau-back. The toggled elastic, safety buckles, and drawstrings of a hiker’s backpack cinch the body in technical tops and dresses for a play of ruched volume. Moments of graphic embellishment arrive as fractured mirror effect embroidery, braided rubber balloon trims, ‘propaganda’ screen-prints, and poetic cotton needlepoint on silk or velvet. Both upending and conforming to the colour signifiers of a traditional garment, the colour card defies expectation. Within a single garment, traditional grey men’s wear checks, taupe outerwear, and hi-vis sports hues are paired with eccentric touches of neon-tone knitwear, jewel-toned metallic leather or sheer organza, and bright raincoat yellow cotton. The signature 5AC bag returns in a multitude of original treatments and finishes, from nylon and leather quilting to braided saddlery details, and silver mirror leather burnished with a neon edge. A new saddle bag rethinks the leather satchel in unique oval proportions, featuring a multi-functional strap system that is worn as a handbag, shoulder bag, and backpack. Mykita x Maison Margiela sunglasses are embedded with chandelier crystals, a technique replicated in transparent arm cuffs, collars, and wire halo earrings. The scuba tabi boot features a moulded rubber sole, and an ornate jacquard upper strapped in Velcro. 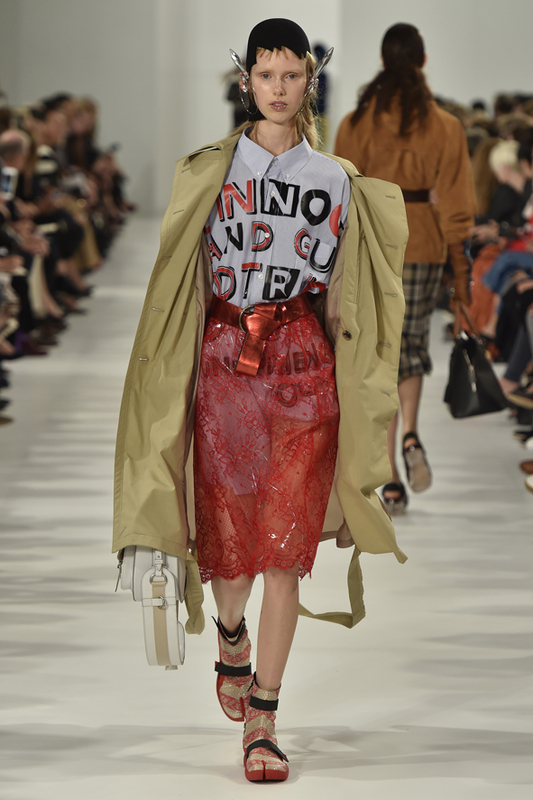 Category: Fashion News Tag: maison margiela, pfw 2016.